Now’s your chance to design the building that best suits your garden and your requirements. Our pressure treated range of open sided Gazebos come in a choice of 3 standard Gazebo designs plus a Pavilion option. However, if you don’t think the exact combination of panels is right for you then choose any combination of solid, diamond trellis and square trellis. Add two front ballustraded sections and, of course, the entrance way and we’ll supply your new Gazebo to your specification. If you site a building within 2m of your boundary fence then it must be under 2.5m in height. Uniquely, our gazebos are 2.49m in height and therefore don’t require any planning permission unless you have a listed building or live in a conservation area. Please ask for details if you are in any doubt. 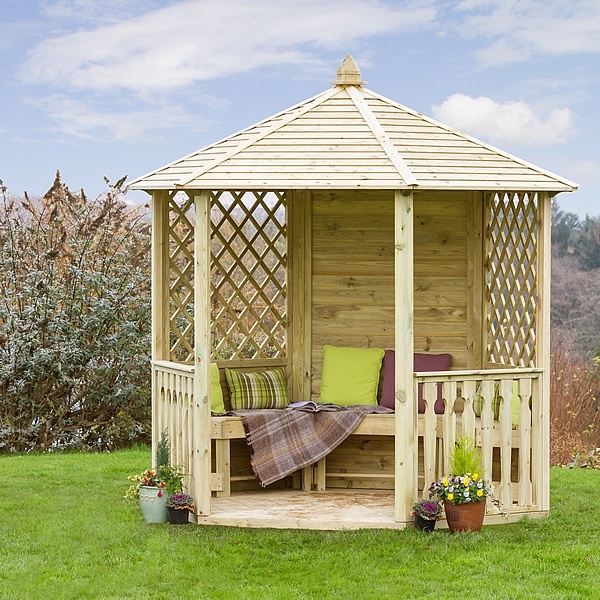 Any garden building requires a firm and level base and our open sided gazebos are no exception. Slabs or concrete are the best option. Installation is straightforward with the instructions supplied but if you don’t want to tackle this or if you are unsure about the base please call 0800 999 0123 or visit your local display centre to discuss this with our site staff. 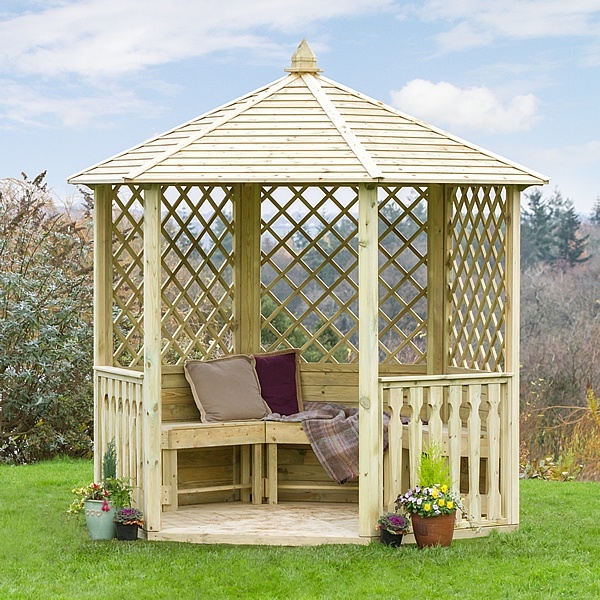 The Wenlock Gazebo has diamond trellis either side of a solid rear panel and two balustrade sections either side of the entrance. This image illustrates how the Wenlock looks when you replace the solid rear panel with a diamond trellis panel. This option gives you a 360º view of your garden. All Zest Summerhouses are delivered by our trusted courier service. As with all of our garden buildings, we like to provide our customers with a suitable delivery time. We always give good notice of our intended delivery date, allowing you to be sure it is the right time for you. Our delivery times can vary from season to season, but typically you should expect to receive your building around 28 days from when you order. Please feel free to contact us on 0800 999 0123 to check our current delivery times. When your order is ready for despatch, we will contact you to arrange your balance payment and agree a suitable delivery date. We require at least one person to be present at the time of delivery. All items delivered by our courier should be checked for damages. In the unlikely event that you find any damage, this must be noted on the delivery note by writing 'Goods Damaged'. Any packaging supplied with the building will need to be disposed of by you. Where Can I See Zest Open Gazebos and Shelters?